CLOTHING YOU WILL WANT TO WEAR FOR YEARS. Digitally made clothing that is 100% recyclable! Dr Kate Goldsworthy is a leading researcher in sustainable textile design and development in the UK. Dr Kate Goldsworthy excites me. After all, I am passionate about sustainable fashion, eco wear and green living, in general. But most of all, I am a textile fetishist. Dr Kate, (Can I call you that? ), completed her PhD research on re-imagining the way we could manufacture textiles. 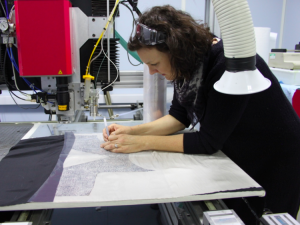 She created ‘Laser-Line’ a new production system for designing synthetic textiles that can be fully recycled. The Zero Waste Dress is using the ‘Laser Line’ production system together with ‘Minimal Seam Construction’ concepts (the work of her partner in this project, David Telfer). The garment prototypes are designed to be produced in a single-step digital manufacturing process which cuts, seams and finishes the product in a flat-bed system, with zero process waste. Indeed! It is 100% monomaterial (‘made of one thing’) and suitable for full chemical recycling at end-of-life. It’s still early days, but…What the Awesome!? What do you think? Heard of anything similar? Let me know. Check out this video below. Does it bend your mind too? and receive very special offers, inspiration and resources.